If you are using MCA business and is using Merchant Cash Advance software for your alternative funding business, what should you do next after attracting a high volume of leads? Remember, not all leads are the same, and therefore, separating the good leads from those that are not can be really challenging. This is exactly where if you are using an easy to use Merchant Cash Advance CRM solution like ConvergeHub, solid lead scoring comes into play. According to a report published by APSIS, only 44 percent of companies are presently using lead scoring systems to grow their business. Therefore, before it gets too late you as a user of MCA CRM software should maximize this methodology and leverage your alternative lending business from your competitors by unveiling meaningful insights to improve your sales processes and your funnel. In fact, lead scoring is a time-honored process, which most often exceeds expected benefits such as sales productivity and effectiveness, increased conversion ratio, and measurable ROI. However, even before we delve into how we can build an awesome lead scoring model for your MCA business, let us talk primarily about whether you should have it and if so why. Candidly, lead scoring is truly a tedious process, therefore, it is most essential to determine if lead scoring is suitable for your MCA business, to ensure that you do not waste time, money, and effort dedicated towards it. Why Implement Lead Scoring in MCA business? The most intriguing factor about lead scoring techniques is it does not come as a “one-size-fits-all” methodology. In fact, not every business needs an advance lead scoring model for their business. Nevertheless, lead scoring provides your business with a scientific and automated means to rank your leads, in a quantifiable manner, to calculate their perceived value in your organization. Suppose Jack, an owner of a large departmental store, visits your website. Since you do not know about him yet, he starts from the score of 0. However, as he interacts with your website more his scores increases subsequently. Per say, information about his title (+10 Points), he requests a cash advance demo (+10 points), he is from a large retail outlet (+5 Points). Now, once your lead reaches a certain point (based completely on your individually created criteria), where Jack is deemed sales-ready, it is time to send your sales team to reach out and convince Jack to convert him into your customer, by closing the deal. 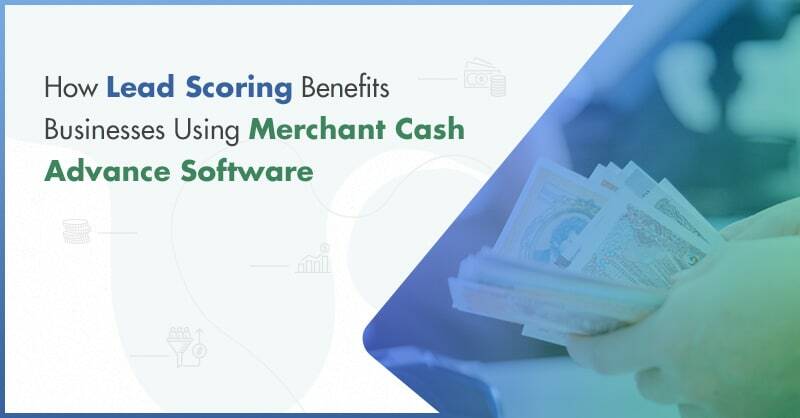 The lead scoring technique is most often used with Merchant Cash Advance CRM software for improving the sales process, align marketing and sales, prioritize leads and lastly for creating higher quality conversions. Now, to determine if lead scoring is required for your cash advance business, here are some questions you should consider as a user of MCA CRM platform, which aids in implementing the lead scoring methodology. –Do you have a very high volume of leads flowing in from several channels, than your sales team can follow up within a specific time? – Do you have enough information in your MCA CRM database for lead scoring? –Do you have a particular content from a lead nurturing strategy, which needs to be delivered to a lead at a specific time in their buying journey? –Do you feel that your sales processes can be more effective and efficient than what it is now? If your answer is affirmative for all or most of these above-mentioned questions, then we would readily recommend that your alternative funding business organization is ready to start with a lead scoring system. Otherwise, we would suggest you to primarily focus on generating more leads, establish an SLA (Service Level Agreement) between your marketing and sales teams, and collect and track the right information from your forms and website. If you do not have enough leads to start lead scoring for your business, do you know ConvergeHub offers FREE LEAD GENERATOR Tool, which is a free lead generation software that you can easily download from ConvergeHub website? Implementing a lead scoring methodology is extremely difficult to do manually (using spreadsheets) as a lead’s activity can change every day. Therefore, you need Merchant Cash Advance software or online lead management software, like ConvergeHub, which has an excellent lead management system to implement the modeling we will discuss below. According to SiriusDecisions 68 percent of B2B (Business-to-Business) companies are applying lead scoring. However, on the other hand, only 40 percent of sales reps have said to have found value from it. Although various factors can contribute to the failure of this remaining 28 percent, we are sure if you start on the right foot when implementing this system, the lead scoring methodology is always beneficial, especially as your business grows in years and becomes more complex over time. Primarily, you need to outline what your MCA business needs by identifying your ideal lead. To begin, you need to select the demography based on your lead’s characteristics. Like, who are more likely to purchase your offerings compared to others? Is it small or large enterprises? In what industry/business and in what level? Assign points based on your ideal lead. For example, for company type, you may assign higher points for B2B and lesser for B2C leads. This also works for the lead’s industry (like retail, small shop, large departmental store, among others) and seniority (like the owner, the floor in charge, sales rep and others). The second type of data that you need is how your lead interacts with your website. This process of lead scoring is based on the actions that the lead performs to indicate their interest. While in this behaviors such as opening an email, attending a webinar, or request a demo gets a higher score, similarly unsubscribing from your email list or webinar or canceling a demo request gets negative points and consequentially that lead goes further down the sales pipeline. Apart from this, it is also important to consider your leads activity levels before you consider and mark your leads with the help of lead scoring as sales-ready. Now once you have completed your basic framework, you can combine the information found in both these data, to paint a complete picture of your lead. Note: It is always best to keep a separate and a combine sore of the two data. Because although the demographic data normally remains stable, the behavioral data can always change over a certain period of time. Now, that using your lead scoring framework you have created a foundation of your Marketing Qualified Leads (MQL), whereby your MQL are more likely to convert into a customer, compared to other leads based on their demographic and behavioral data. To set up a lead scoring process, you will have to assign points or scores as a basis for your lead scoring methodology. For this, it crucial that your MCA organization to extract insights, use lead intelligence and analytics of your Merchant Cash Advance CRM software, to find the unique attributes including customer base, sales cycles and key differentiators that focuses on your efforts on finding high-quality leads, which results in more conversions. It has often been said by many that figuring what the score should be may be one of the hardest parts of the lead scoring process. In most of the cases, the threshold for the lead scoring scale ranges in-between 0 to 100 (but you can also set any value as you like). In ConvergeHub Merchant Cash Advance CRM software, you can easily segregate the leads into three main categories: Hot, Warm, and Cold. Leads that have a score of over 80 can be considered ‘Hot’, while leads that get a score between 30-80 can be denoted as ‘Warm’, while ‘Cold’ leads should have a score below 30. Although, you can always customize the range based on your company’s individual preferences and needs. The main point of implementing a lead scoring process is to identify the leads that are ready to accept your alternative funding services. Therefore, by identifying leads, which are sales ready (with a score in-between 80-100) your sales reps can prioritize whom to follow up with to maximize their time. When 73% of leads are not yet sales-ready, this is where this process becomes more crucial, as you have to make sure your sales team will only reach out to the lead once the opportunity is right. Since the lead score can change every day, a tool such as an easy to use CRM solution featuring lead scoring updates the score instantaneously based on your criteria. These three steps mentioned above are the most crucial factor to cover while implementing a lead scoring methodology in any business. However as lead scoring models are never sacrosanct or set in stone, it is only by testing in real-world scenarios; you can get a hands-on and more reliable results. So monitor your MCA lead scoring model for a few months and then if needed revise the scoring criteria and the lead scores against each of these criteria by analyzing past leads before finalizing your lead scoring process. A lead scoring model that is based on data collected with the help of Merchant Cash Advance CRM software for the growth of your alternative lending business is a real game-killer. Always be open for improving, testing, and tweaking your lead scoring model, since although developing a lead scoring system takes time, but its effects can always be improved. Therefore, involve your sales department and check in monthly or every fortnight to make sure everything is working fine, since behavioral lead scoring needs to be reset over time, to identify scores that need to be redefined according to the behavioral data of the leads, which can change over a certain period of time.